Brooks Koff “paints with glass” creating unique Stained-Glass Mosaics that beg for a sunny window to catch and transform light into brilliant color! 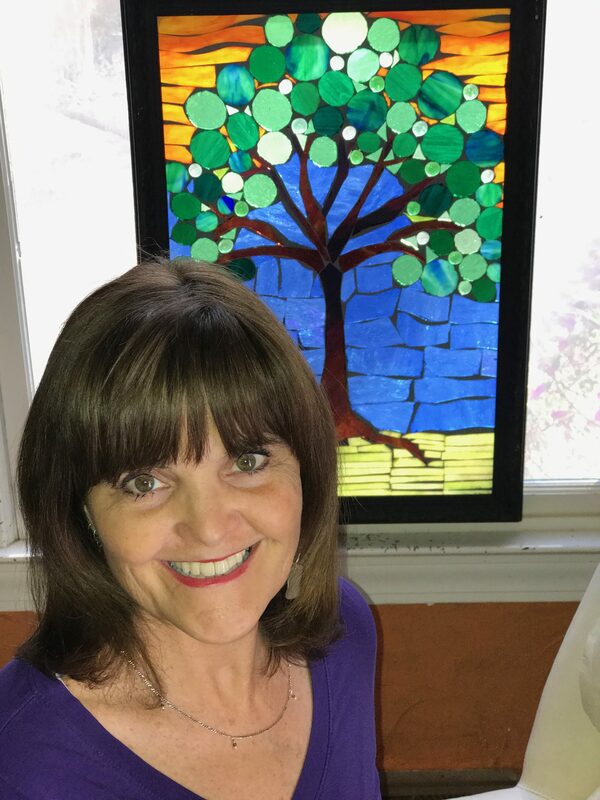 Unlike traditional stained-glass work, her pieces are created without the use of patterns, giving her freedom to fully explore color and design. For nearly twenty years, Brooks volunteered as an art teacher at her children’s elementary school, New Horizons. In 2004, she was invited to be one of the contributing artists to the Minnie Evans Sculpture Garden and Bottle Chapel in Airlie Gardens. She helped over 100 local students create the mosaic stepping stones that adorn the foundation and walkway into the chapel. She also created a tribute piece to Minnie Evans–a small mosaic wall around the back of the structure. Her work has been featured in many local magazines – Encore, WILMA, Wrightsville Beach Magazine, SALT, and Haven (the Bald Head Island Magazine) – as well as highlighted on a nationally syndicated PBS show. She participates yearly in the Heart Art Show at the Cicada Metals Gallery, Art for the Masses, and the Spring Flea at the Brooklyn Arts Center. She’s an army brat and the self-proclaimed “well-adjusted middle child” from a family of eleven children! She and her husband raised their five children here in Wilmington—several of whom have grown up to be artists themselves.